Mulbarton is a pleasing village scattered around a large common, just to the south of Norwich. It feels further away from Norwich than it actually is. 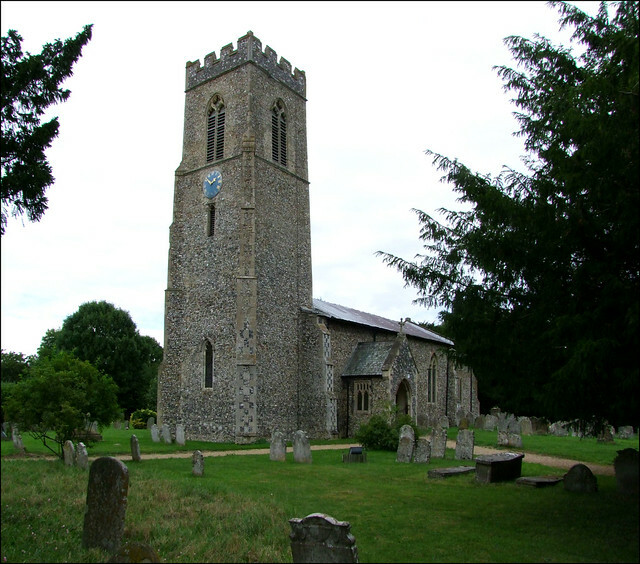 The church sits on the east side of the common, its late 14th Century tower rearing dramatically up above the open spaces. St Mary Magdalene has been a while getting on to this site, simply because it is one of just three churches in England, out of all the thousands that I have visited, to which I was refused entry. This is probably a testament to the generosity and welcome of all the other thousands of churches rather than anything else, and it must be said that the keyholder here was very nice. But he'd been told he couldn't let anyone into the church unaccompanied, and he couldn't leave the house because he was waiting for a phone call. It might be anytime that morning. This didn't help me much, of course, and I did not return to Mulbarton for four years. We came back in Open Heritage Week 2010, and were pleased to find the church open, and being stewarded by a very jolly northern couple who had retired to Mulbarton. They had clearly fallen in love with St Mary Magdalene, and were full of enthusiasm. Fortunately, I already knew quite a bit about the church because it is a significant one, with more than its fair share of important survivals. Perhaps the best of these is the collection of medieval and continental glass in the chancel windows. They were assembled in the early 19th Century, but have presumably been reset since, probably by the King workshop. It is quite likely that none of it came from this church originally. Most memorably, a 15th Century Adam puts his back into digging with a spade, and this particular image is one of a pair, the other being Eve spinning: When Adam delved and Eve span, who was then the gentleman? But Eve is twenty miles away in Martham, and history records that a Rector moved from Martham to Mulbarton in the early 19th Century, bringing this Adam with him, and probably some of the other glass as well. Some of the glass is composite: what must have been an exquisite image of St Anne teaching the Blessed Virgin to read has been given the head of a prophet. Another dramatic figure, Powers from the Orders of Angels, bestrides the devil he has defeated, but he also has a prophet's head. A more complete figure may be an Old Testament king, although he has also been identified as St Ethelbert. There are two earlier figures of a king and a bishop, as well as two panels of continental glass, one of which depicts three prisoners, possibly the Apostles, and the other, a roundel, a continental Bishop. The 20th Century panels depicting a nun and a monk in the pose of donors is a nice touch, and above are two exquisite 15th century angels, one playing a harp and the other a lute. Unless you are interested in old glass, the most striking and memorable feature of the church is its range of impressive and eccentric memorials. The best of these is beside the tower arch, and is an impossibly high memorial of 1675 to the lawyer and landowner Sir Edwin Rich. It is fully of its date, as lively as a Restoration comedy, surmounted by a huge hourglass which, now broken, looks like an upturned stool. I wouldn't have wanted to be underneath when the rest of it fell. The scrollwork is, as Pevsner puts it, coarse, as if done more with enthusiasm than skill. The inscription reminds us that Our lyfe is like an hower glasse and our riches are like sand wch runnes with us but the time of our continuance her and then must be turned up by another. It goes on to enjoin us to speake to God as if men heard your talke, and to lyve with men as if God sawe your walke. Famously, it continues that Thetford gave me breath, and Norwich breeding, but also records that he had to go to Cambridge for learning. Sir Edwin is also mentioned on his brother Robert's memorial, a roughly contemporary tablet reset rather awkwardly beside the south doorway. Under a pediment which proclaims the key Christian virtues it notes that Edwin and Robert's father, an earlier Sir Edwin, was Knighted at Cadiz and bought this mannour in the 42 year of Q: Elizabeth, but later dyed and was buryed at Hartlepool. Robert himself was buried at nearby Swardeston in 1651, but later dug up and brought here to be laid in the family vault that the younger Sir Edwin had constructed. In the chancel, the Lany memorial of a century later is elegant and of high quality, but most curious of all is the nearby memorial to Sarah Scargill, the Rector's wife, who died in 1680. The moing inscription to her, written by her grieving husband, is contained in a closed book which can be opened to reveal it. Another feature which needs to be revealed is the reredos, now hidden by curtains. It probably dates from the 1930s, and in painted wooden relief depicts the Risen Christ appearing to St Mary Magdalene in the garden on Easter morning. It is very good of its kind, in muted colours with a hint of Art Deco about it. It's a shame it isn't openly on view. Meanwhile, at the west end of the 19th Century north aisle are two windows of 1907 by the AK Nicholson workshop, depicting St Anne and Dorcas. They are rather unfortunately obscured by junk, but are excellent examples of the workshop's early style. All in all, a church full of interest, which deserves to be very much better known.